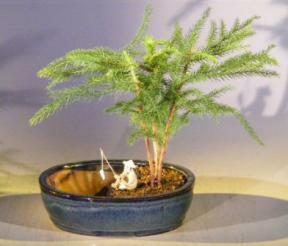 Open and airy conifer (cone bearing) with light green foliage turning darker with age. One of the best known trees from the South Pacific. Will tolerate warm temperatures and does not even object to dryness, although it does not like glaring sunshine. Decorates well for any holiday or season. Forest tree group - each 5 years old. Very easy indoor care. Our tree is planted in a water pot which has a well on one side that holds water. We include a fisherman figure along with a fishing pole and ceramic fish. The entire landscape is arranged in an attractive, glazed, imported ceramic container.